I have recently joined the Hardy Plant Society . 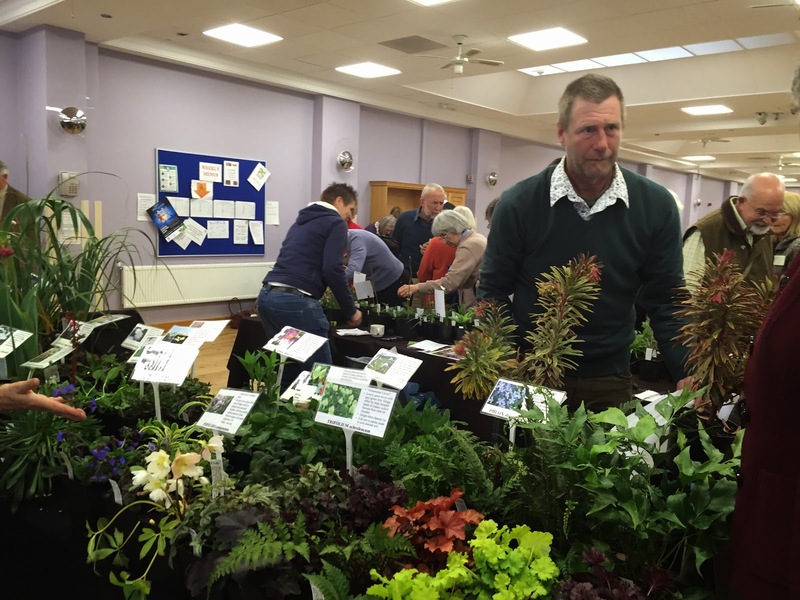 There is a good local group nearby who put on an interesting programme of speakers and there are usually some plants sales as well. It is a good way of getting access to some specialist nurseries without having to travel too far. What also prompted me to join was the AGM lecture day which was being held in Nottinghamshire this time. 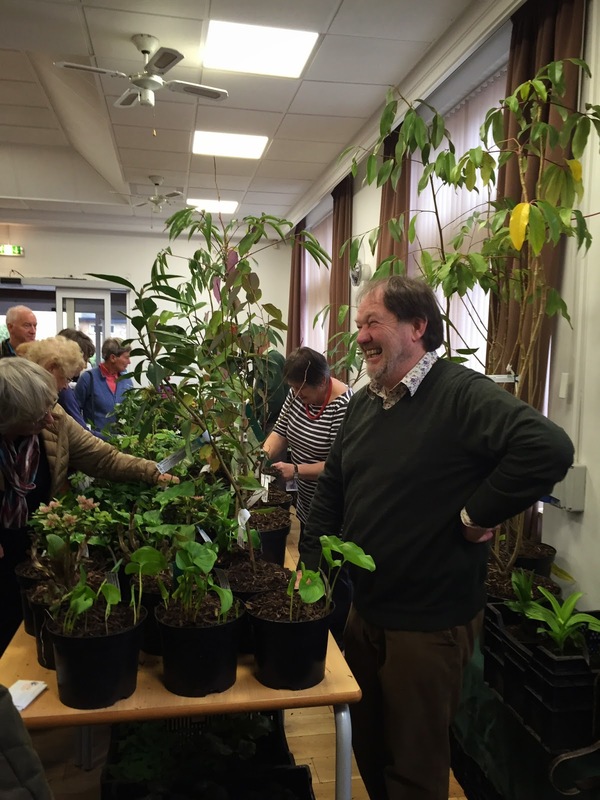 There were two lectures being held, one by John Grimshaw who is the Director of the Yorkshire Arboretum as well as a writer, RHS committee member and botanist. The other lecture was by Bleddyn and Sue Wyn-Jones from Crug Farm Nursery, a nursery I have visited several times as I rate it so highly. It is now pretty much impossible for me to visit North Wales and not call in. The presence of Crûg meant that there would be plant sales from the nursery, I needed no further convincing to attend this event. The AGM was held at Portland College in North Nottinghamshire. When we arrived, which was quite early, the plant sales had already started. the plant label describes it as 'a must have plant when seen in flower' and 'positively obscene', well how could I refuse such a plant? a very blurry plant I am sure you will agree (it was blowing half a gale when I took these photos, honest). It is a Ranzania japonica, it does not look much at the moment but has very pretty lilac/pink flowers and it will look good in my woodland border. Anisodentea 'El Royo'. I have tried this plant previously and whilst it got through the worst of the winter a couple of years ago, it died at the last moment. This time I think I might try someone where a little better drained and a little more sheltered as they are meant to be quite tough. yes, blown horiztonal - it was gusty. I have not tried this clematis before so I am expecting great things from it. an Acanthus mollis from the Society members' stall. I have grown this in other gardens and it is a plant I like to have. I also picked up some free seeds, quite a few free seeds and this made me happy too, especially as I got some Euphorbia stygiana seeds, a plant I have recently written about in a post for the Leicestershire and Rutland Gardens Trust. The lectures were excellent. John Grimshaw took us through a personal journey of Plants, Gardens, People. It was an entertaining and informative talk. I liked his concept of hyphenated gardeners (I so want to hyphenate that), saying that he was not an alphine-gardener, a perennial-gardener etc etc, he is just a gardener (and quite a gardener at that!). John ended his talk giving out some free white poppy seeds originally sourced from Sissinghurst. Yes I got some, how could I not? A reminder of a good day, a plant I love more than most others and a link back to Sissinghurst. After the AGM then there was the talk from Bleddyn and Sue about their plant hunting trips to Vietnam. This was also fascinating and at times quite saddening. The country has lost much from its years of war and the effects on the population and the effects of climate change mean that the forests are being stripped of their trees to grow crops to sell for food and also for fuel. This is completely understandable as there is limited choice as to what the people can do, but for the plants of the area it is very damaging. All in all it was an excellent day. The next AGM is in the southern counties, it might also be a must-do event.